Gas: up 1729%, or 3.3% annualized. Cars: up 1936%, or 4.9% annualized. Disneyland: up 22,757%, or 10% annualized. Milk: up 292%, or 2.6% annualized. Stamps: up 463%, or 4.2% annualized. Note that almost all of this inflation was before the era of Obama trillion-dollar deficits and Zimbabwe Ben monetization of same. That is, the forward inflation could be a lot higher than the past inflation we see here. You're still keeping a portion of your long-term savings in cash or bonds? Why? The Department of Homeland Security Stole my Boat Today. You may have heard there was a shooting and car crash that left three people dead on the Las Vegas Strip early Thursday. Leave it to the LA Times, via reporter John M. Glionna, to unleash its own fiery wreck of politics and misinformation. Pillat said he had come to expect violence on the Strip. "It's the Wild West here. People don't understand. They think it is fun and games. It's not. It's dangerous," he said.Okay, that's an interesting assessment. Get a bum's opinion. Never mind the statistics, or the objective fact that the Las Vegas Strip is one of the most surveilled, heavily policed metropolitan areas in the world. ... bad toupees and HDTV. This Monday, as you're hitting the slopes or otherwise enjoying the three-day weekend, please remember the man behind the holiday: Gerard Finneran. Gerard Finneran was born February 16, 1937. Truly a renaissance man, Finneran was a multi-sport athlete who went on to an extraordinarily successful career in banking. The details of Finneran's long and storied career are chronicled here in a 2005 obituary. But he will always be remembered for that one, shining moment. A quarterback for the Air Force Academy, Finneran would come to be known for a far greater feat in the air. ... on a flight back from Buenos Aires to New York, Mr. Finneran had a bit too much to drink. NASA to chronicle near-miss asteroid fly-by. ... which reminds me: have you watched Melancholia yet? So technically challenged John Broder wrote a scathing review of one of Tesla's cars for the New York Times here. He claims all sorts of things which Tesla responds to here with data. Hilarity ensues. Tesla's rebuttal to the article was basically that Broder lied. Tesla shows the log files illustrating that the claims Broder made were false. Imagine that, a newspaper guy not realizing that technology is everywhere, cars log everything now, and someone as sharp as Musk is not going to be played the fool. Not on our list of usual topics here but something that does exemplify the flaws of liberal solutions: solving racism in world soccer. For those that aren't aware there are many folks in many stadiums throughout Europe who when a black player touches the ball they start shouting monkey chants. Completely infantile and moronic but it really pisses a lot of black players off to the point that they even just get up and leave the field. For example the monkey chants were so horrific, so evil that Ghanian midfielder Kevin Prince Boateng of AC Milan kicked the ball into the stands and the walked off the field with his team in tow here. HAH! Have that evil racists! We've pointed out the package shrinkery trick that food sellers have used to hide price inflation, but this is ridiculous. Maker's Mark watering down its bourbon by 6.7%. That's amazing for a premium brand like Maker's Mark to feel the need to reduce quality. They must believe consumers have hit their limit on what they can pay for a bottle of bourbon, so price increases are out of the question. Meanwhile, grain, energy, and labor inputs aren't getting any cheaper. May Zimbabwe Ben be forever remembered as the face of New Maker's Mark just as Bill Cosby was the face of New Coke. UPDATE: Maker's Mark backtracks faster than New Coke. Conan played a tragically funny new AIG commercial that I think hits home on the surface of the bailout abomination. Of course if Conan had really wanted to portray it accurately we would have seen Jamie Dimon, Lloyd Blankfein, Timmy Tax Cheat and The Bernank saying the same thing regarding AIG's bailout: Go F#$@ Yourself America. For someone who has spent years covering stocks and financial markets, this guy is completely clueless about some really basic stock fundamentals. He doesn't know the difference between market price and a balance sheet. Take a look beginning about 1:15 of this video. Sullivan: "Three-fourths of the stock price is effectively cash or short-term investments... you're paying for about 25% of the business is [sic] the stock price. 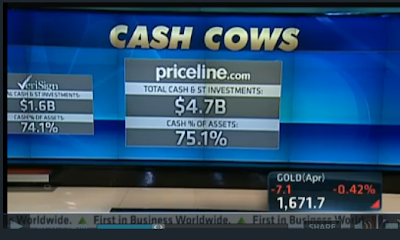 That's why we look at cash," he knowingly lectures CNBC viewers. In two separate incidents, pants-wetting LAPD officers have now shot at innocent people for driving trucks that resemble the vehicle of the killer the cops are the target of. In the first, the police shot two reportedly elderly Asian women delivering newspapers. Because obviously they looked exactly like a giant lone bald black man. In the second shooting in Torrance, no one was injured. It's time to disarm the police. Only civilians can be trusted with guns. Only the police should have guns, you know. The shocking double murder of a young couple in Irvine turns out to have been suspectedly committed by a disgruntled former LAPD cop. The female victim is apparently the daughter of an official somehow involved in the suspect's firing from LAPD. Oh, yeah. He's still on the loose, armed to the teeth, batshit insane, and angry as hell. According to documents from a court of appeals hearing in October 2011, Dorner was fired from the LAPD after he made a complaint against his field training officer, Sgt. Teresa Evans, saying in the course of arrest she kicked suspect Christopher Gettler, a schizophrenic with severe dementia. Dorner denied the allegations, KCBS says. Following an investigation, Dorner was fired for making false statements. A number of teachers and parents are asking the Carlsbad Unified School District to delay the planned August opening of Sage Creek High School, arguing that it will strain resources and isn’t needed at this time. “This new high school is just going to be a ruination of the district,” said Sheila DeKosky, a Carlsbad High teacher who created the website www.delaysagecreek.com last month. Moors and board President Elisa Williamson said the district’s plan to open Sage Creek follows through with the commitment it made to build a second school when voters passed the $198 million Proposition P bond initiative in 2006. But DeKosky — along with several people who have spoken to the board and posted comments on her site and a Facebook page — argue that the new school is unnecessary and too costly to open at this time. or, the Celebrated Murdering Maestro of Calaveras County. Calaveras County is in the California gold country in the foothills of the Sierra Nevada mountains. It was made famous in the Mark Twain short story The Celebrated Jumping Frog of Calaveras County. It was not the 19th century gold rush, but the 21st century real estate rush, that brought us today's tragic tale. The Calaveras County Sheriff's Office has identified the three people killed in the suspected murder suicide in Murphys.